Small purple, pink/ white flowers clustered on ends of sticks with tiny leaves. Very good antiseptic for both internal and external use in combatting bacteria, virus, infections and fungus in the digestive, respiratory and genitourinary tracts (eg- candida, yeast, fungus, etc) and skin conditions like athlete’s foot, ringworm, rash, acne, cuts, injuries, sores, burns, crabs, lice, wrinkles, and any injuries on body. Great balm for face. Has soothing properties if inhaled or drank as tea for calming bronchials, asthma, coughing, chest infections, hay fever. 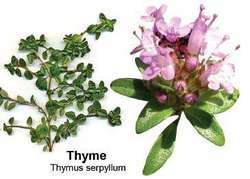 Thyme is an expectorant that helps remove fluid and phlegm. Helps alleviate problems of the digestive tract like spastic colon, IBSirritable bowel syndrome. The combined antiseptic and astringent properties of thyme are used for diarrhea while restoring healthy bacteria levels, particularly in handling candida. Helps decontaminate the liver, gallbladder and invigorates the whole digestive system. Also used for indigestion, blood circulation, immune system, expelling worms, depression, fatigue, anxiety, sleeplessness, urinary tract infections, gout, and removing contagions of the reproductive organs. Another plant called “Mother of Thyme” (Thymus serpyllum), a low ground-cover used around stepping stones is also edible. Content and composition of the essential oil of Thymus serpyllum L.